Angioplasty and coronary bypass are two of the most common surgeries performed today. But despite the procedures’ widespread use, how successful are they really? Research tells us that up to half of all angioplasty patients experience restenosis (another blockage of the same artery) within six months of the procedure. And up to 20 percent of bypass patients see their grafts close up again within a year of surgery. According to a doctor in Switzerland, there is a better way. In fact, he says this non-invasive, organic protocol for clearing plaque from arteries (Lipostabil) has been around for decades -but got lost in the black hole of the pharmaceutical industry. And he says this approach isn’t just for heart patients-it can improve circulation in diabetics, boost male sexual performance, and even reverse the ravages of aging. The cell is the most basic unit of human life. Every organ, every bone, every bit of skin in your body is composed of cells. 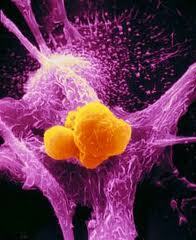 But if we zoom in on an individual cell, we see that it’s a complex organism in its own right. Phospholipids activate the enzymes that trigger protein receptors on the cell membrane to receive neurotransmitters, hormones, peptides, antigens, antibodies, and other biological messengers. They also regulate many different metabolic processes in the cell membrane, and influence the synthesis of prostaglandins from essential fatty acids. In short, without a properly functioning phospholipids structure, your cells are in trouble. And while nearly all of us have a ready supply of high-functioning phospholipids when we are young, things can start to unravel as we age. Of the two main kinds of EPLs, PC generally outnumbers SM in cell membranes as much as nine to one, although this ratio varies depending on the function of a specific cell. But as we age, a number of factors conspire to impede the body’s own synthesis of PC. Years of exposure to free radicals, disease, allergens, and environmental pollutants can upset the delicate balance. Furthermore, the body’s natural production of PC slows over time. The result is an inadequate supply of PC-and consequently, defective cell membranes. When cell membranes aren’t functioning properly, all sorts of things can go wrong. Nourishment can’t get in effectively, and wastes can’t get out. Enzyme function is disturbed. Receptors can’t function properly, causing all sorts of imbalances. All of these problems contribute to a destructive cycle-each ultimately weakens cell membrane stability even more. How does all this relate to the heart? These effects manifest themselves most vividly there, because the heart gets attacked inside and out. When phospholipids in the cell membrane become unbalanced, cholesterol synthesis is disrupted, causing an increase in circulating LDL, or the so-called “bad cholesterol.” At the same time, the phospholipid imbalance impedes the function of heart muscle cells, making it harder and harder for the heart to pump blood through those ever-narrowing arteries. Both factors together contribute to atherosclerosis, a common-and potentially deadly-problem in older adults. Doctors have known about the critical relationship between phospholipids and cell membrane function for decades. So the next logical step was to see if they could replenish the body’s dwindling supply of PC somehow and reverse the destructive cycle. Abstracts of several more recent studies support the hypothesis. One Russian study shows that an intravenous injection of soybean PC into rabbits with atherosclerosis effectively lowered cholesterol levels in red cell and platelet membranes, improved membrane permeability and reduced platelet aggregation. It also increased ATP activity in the cells, the nucleotide that serves as an energy source for many metabolic processes and is required for RNA synthesis. Another Russian study compared the effects of EPL versus niacin on cholesterol levels in 100 patients with ischemic heart disease. After six months of treatment by injection, the scientists found that EPL was as effective as niacin in reducing total cholesterol, LDL, and triglyceride levels. Both approaches also reduced the intensity and number of angina attacks per week, but only the EPL patients demonstrated an increase in exertion capacity in a cycling test. That is, until Dr. Sam Baxas at Baxamed Medical Center in Binningen, Switzerland resurrected it. Dr. Baxas had some experience with Lipostabil earlier in his career, but when he inquired about it again he found it was no longer available. After re-reading the EPL research from years ago, he was convinced of its viability and determined to make an EPL product available to his patients. He found a pharmaceutical company in Germany to re-create the Lipostabil formula and began using it with a small group of six patients. According to Dr. Baxas, the results in these patients were nothing short of amazing. Two had already undergone bypass surgery; a third patient had gone through two angioplasties and still suffered with angina; and a fourth had a Thallium stress test indicating serious blood flow problems in his heart. The last two patients had serious circulation problems threatening their legs and feet. All six received intravenous infusions of Dr. Baxas’ EPL solution several times a week for several weeks for a total of 40 treatments. And according to Dr. Baxas, at the conclusion of the study all the participants were completely free of symptoms and no longer dependent on medication. The heart patients no longer had angina pain, and a follow up Thallium test showed no perfusion problems. In the patients with circulation problems, skin color, temperature and pulse rate were normalized, and pain while walking disappeared. Since then, Dr. Baxas has used his treatment on many patients and seen remarkable results in relieving angina and improving circulation to the extremities. In 2001, he began making his EPL protocol available to doctors around the world. And as more and more people began to use it, he noticed some interesting things. The heart and the circulatory system weren’t the only parts of the body that benefited from EPL infusions. Sure, improved heart function and improved circulation yield wide ranging benefits in the body. But that couldn’t completely explain the results Dr. Baxas was noticing. Patients who underwent EPL infusions looked and felt younger. They had more energy. They were healthier. They even reported an increase in libido, and men reported an improvement in sexual performance. After some thought, Dr. Baxas decided that it all made sense. Phospholipids are present in the membranes of all cells, not just heart cells and blood cells. And all cells experience an imbalance of PC and SM as the body ages. Providing additional PC to the body was bound to improve the cell health of cells throughout the body, making them function again as they had in younger years. Dr. Baxas is determined not to let the EPL protocol slip into obscurity again. But he’s also experiencing how difficult it can be to champion an alternative approach. Since 1995, he’s called his product Plaquex. But just recently, a major pharmaceutical company launched a trademark dispute on the name, over a new drug they are introducing. So Dr. Baxas was forced to change the name of his product to X-Plaque. Doctors across the country and around the world are beginning to offer X-Plaque treatments for their patients with atherosclerosis, circulation problems, and aging concerns. Meanwhile, the original Lipostabil is available from Switzerland again. Ask your doctor about this safe and effective treatment for the diseases of aging! In America one can use an equivalent product called PTC from any compounding pharmacy.